I Rub My Duckie Paris Gold Massager is the most glamorous Paris yet hits runways this fall in luxe gold with black floral tattoo, removable feather boa, Swarovski crystal beak jewel and 3 speeds of vibration, from gentle to intense. Still timelessly waterproof and quiet, Paris Gold is a discreet companion. Gorgeous gold and black floral packaging, complete with a black satin handle, makes Paris Gold a fabulously easy and decadent Gift. With Paris Duckie, life and bath time are truly magnifique! Specifications 1 speed. Available colors: Gold as shown. Each sold separately. I Rub My Duckie dimension 5 inches by 3.5 inches by 5 inches. Battery requirements 2 AA. Alkaline batteries not included. 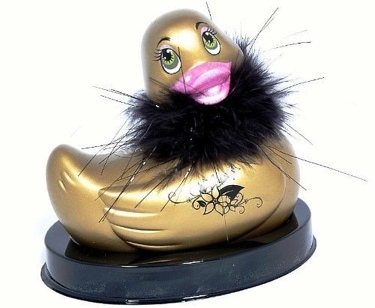 Duck massager contains no: Latex, Natural Rubbers, Phthalates or Toxic Heavy Metals like Cadmium and Lead. International Safety & Environmental Compliance: CE, ROHS, WEEE and ASTM. Big Tease Toy toys that play with you.